Egg-Poaching Bags are a brilliant new invention. They allow water to contact the egg, without the raw egg leaking into the water. 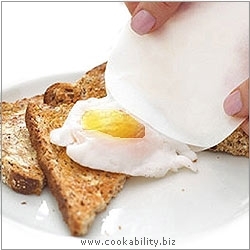 After a few minutes your delicious poached egg slides out easily using no butter or oil. So you get proper water-poached eggs, perfect first time. Every time. Immerse several together in one saucepan and make as many poached eggs as you want. All at the same time. Proper, water-poached eggs are healthy and delicious. ...now they are simpler to make than fried, scrambled or omelette. As sold by Lakeland under the Poachets brand name.